My Pick of the Week is early this week. Why? Cause My Pick, happens to be on a Wednesday evening January 26th and will be quite the provocative event at the Santa Monica Museum of Art. The Donkey Show!!! Gotta rsvp for this one and mention KTR Promo to be ensured that you will get in. Are you thinking what I’m thinking? Yes The Donkey Show is indeed referring to the famed event one can witness on wild getaways in Tijuana….but this audio video exploration focuses on deconstructing the myth of what we Americans perceive to be Tijuana. Complimentary snacks and beverages provided. There are three events: 6:00 pm start at SMMOA to view the Cast of Vice never-before-seen F/W 2011 collection.with libations and entertainment 7:00 pm, a conversation with curators and at 8:00 pm, the Party…goes till 10:00 pm. See more details and RSVP INFO below. Known for his incredible Venice Murals, Rip Cronk is currently restoring the Abbot Kinney mural on the side of Danny's. Enjoy special $5.00 "Cronktinis" (Martinis made with rum, St. Germain, and Fresh Grapefruit Juice). 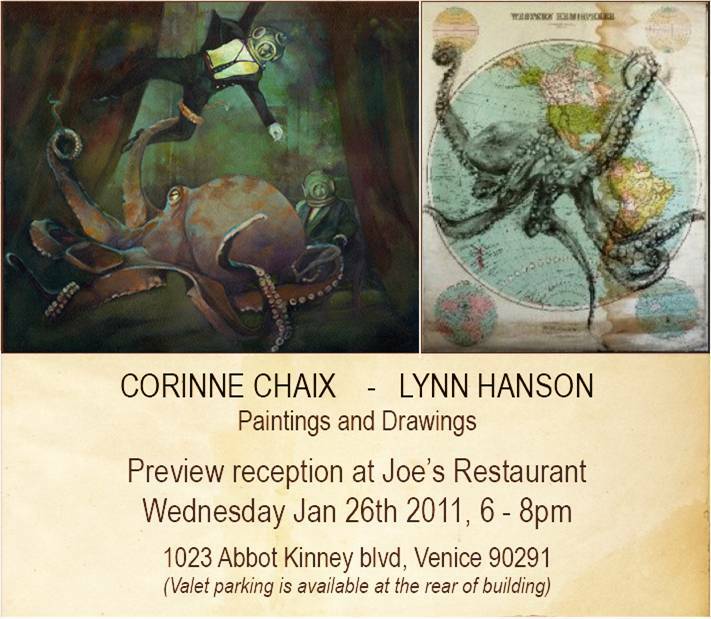 You won't want to miss this preview showing of Venice Artists at the very trendy Joe's Restaurant, located at 1023 Abbot Kinney Blvd., Venice 90291. This exhibition is sponsored by Venice – Santa Monica Community Arts & Performance Events www.V-SCAPE.org. Enjoy tasty complimentary appetizers and wine. The opening begins at 6:00 pm and runs till 8:00 pm. Keep the party going with a bit of a racy, but fun PICK OF THE WEEK THE DONKEY SHOW at the Santa Monica Museum of Art at Bergamot Station. Here are more details. 6:00 pm: Doors open with entertainment and libations at the museum's shop, GRACIE, which features a one-night-only Cast of Vices pop-up store with the line's never-before-seen Collection No.4. 7 pm: The Donkey Show: A Conversation with curators Jim Heimann and Josh Kun, and special guest, author Bill Nericcio at Track 16, Bergamot Station C-1, across from the museum. Party time: 8-10 pm: The Donkey Show Party in the SMMOA courtyard. Music by DJ Clorofila (from the Nortec Collective) and visuals by VJ CRO. FREE Admission Bergamot Station is located at 2525 Michigan Ave. in Santa Monica. Don’t forget to RSVP: rsvp@smmoa.org with subject header The Donkey Show/KTR Promo or call 310.453.9184. www.smmoa.org. Be sure to mention KTR Promo since it is so late. at Warszawa Restaurant (upstairs in the loft) 1414 Lincoln Blvd 90401at 7:15 pm. Enjoy the themed show Venice of your Mind, which features the music of the 60’s and the eccentric artistic legacy of Venice Beach. Thursday, January 27, 7pm – 11pm 410 Boyd St. Los Angeles 90013, corner of San Pedro and Boyd….there is free parking http://www.410boyd.com/ (213) 617-2491. This is a fun funky restaurant right next to Little Tokyo with wonderful exhibitions curated by Andie Villafane.